The new artbook includes never-been-published materials, such as character designs, early sketches, and key animations. Following the former two books, Tekkonkinkreet Film ARTBOOK Kuro (Black) side and Shiro (White) side, which included background arts and met with an enthusiastic reception, it is the third bullet for all animation fans! 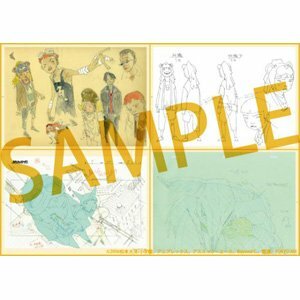 ※All materials included in the artbook are from the film “Tekkonkinkreet.” Materials from the original comic by Taiyo Matsumoto are NOT included. Contents: Character designs, image sketches, key animations, and more. A hand-drawn in-between used in the film, inserted in a STUDIO4℃ clear file. As a celebration of 10th anniversary since the theatrical release of the film “Tekkonkinkreet,” exhibitions, screenings and some fun events will take place in Japan. There are also exciting upcoming items such as an artbook focusing on characters, a new App, and more. Stay tuned to this page for the latest news!